During this season of giving thanks (and rushing arounding buying gifts for our friends and family who likely want for nothing), we thought it would be nice to say thank you to the people in the community who are doing good and find out what projects they are currently working on. First up is a conversation with Kim McNickle with Somebody Cares. 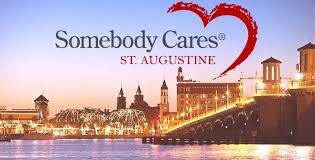 Tell us about how you got involved with Somebody Cares? I got involved with SBC through the founder John Clifton about 5 years ago when I worked for the School District (St. Johns) and Somebody Cares started helping our homeless children with various needs. I grew to respect John and his nonprofit he started 10 years ago. SBC is a national nonprofit that started with one man and a card that said Somebody Cares with his name and phone number and gave them out to the homeless so he could help them. We understand you are trying to secure housing for 4 -5 girls starting in January. What was the start for this initiative? How long do you hope to house the girls? The initiative for the housing is from me meeting so many unaccompanied youth that were homeless due to no fault of their own. They were just trying to finish school while encountering so many barriers. An unaccompanied youth is a child who is on their own without a legal parent or guardian. These students are on their own, trying hard to get through each day without the support at home that most children their age have to help them become successful. This home would let these girls in 11th and 12th grade know that somebody cares and the they can be successful adults that break the circle of homelessness. These girls can stay in the home until they have graduated high school and have a place to go when the summer is over after graduation. Our financial goal for the house is $1200 a month plus utilities and what ever else the girls might need so as to not feel left out in school. We are hoping to help them really focus on school and aspiring towards higher education without worrying where they will stay or eat for the next day. Without this housing project what other options are available to these girls? Without this housing project the girls have to figure out from day to day where they might be sleeping and how they are going to get there. The only shelters we have are for battered and abused women and their children, so if our young ladies are not going through this, they cannot stay there. We also have the St. Francis House which is for single men and women that are older. We do not have a shelter for families or young teen children where they can sleep and feel safe until they have finished high school. Why are they homeless or what is the leading cause of homeless in teens? Some teens are homeless because they have been kicked out of their home. Some parents are on drugs and are also homeless. Some were in foster care and when they turn 18 they are kicked out due to the family not receiving funds for them anymore and then there are others that have to leave because there is just not enough room in the home for the entire family. What challenges does a homeless teen face that is different then a younger child? Teen face not belonging because they are not able to have proper hygiene and can not afford a haircut or shampoo to wash their hair or deodorant and as a teen they really need proper hygiene. They cannot afford their graduation fees or the trips as a senior and feel left out because they cannot afford to pay. They cannot attend after school events because of transportation issues. They might not become involved with activities or clubs at school due to money and having to get to school early or stay after school. These things become barriers that they get tired of trying to break down and will give up. When they do that there is no one there to help pick them back up they are just simply done. Somebody Cares is a faith based nonprofit that feels when we bring the community together we can shine the light of God through helping others and making them feel strong. Together we do much more than we can do apart.